A travel report from Expedia and Airlines Reporting Corporation (ARC) predicts that plane ticket prices will continue to decline over the next year. Popular destinations, including Europe and Latin America, will likely see price drops of 4 to 6 percent. In the first half of 2015, ticket prices dropped an average of 2 percent across Europe and North America, and about 7 percent in Asia-Pacific. The report, Travel Check-Up: Air Travel Trends 2015, looked at global travel trends, ticket prices, consumer demand and the potential to save through travel packages. It was released in early June and is available here. One of the report’s biggest takeaways is that package deals offer the biggest savings. 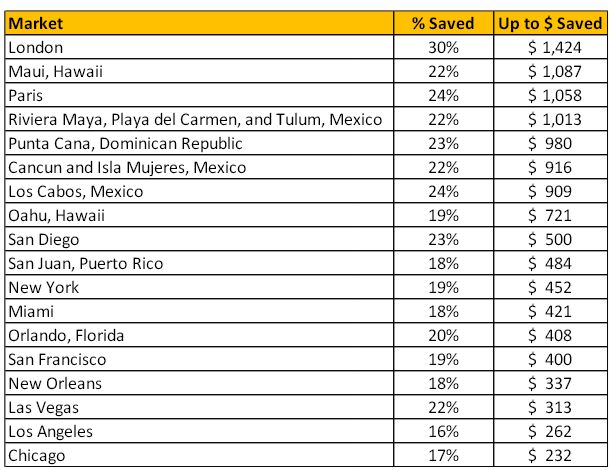 ARC and Expedia found that, on average, consumers saved up to $648 across all destinations when booking plane tickets and hotel rooms together instead of separately. The data was gathered on bundled air and hotel package prices for June through September 2015. The report also studied how long people stayed when they traveled to various locations. Flights originating in the U.S. led to the shortest stays. In June and July, people tended to stay longer when they flew from North America to Asia-Pacific. Travelers originating in Asia-Pacific and heading to Europe in August had the longest average stays. The report’s authors surmised that this could be because the Chinese yuan is gaining strength against the U.S. dollar, causing a surge in outbound travel from China. ARC provides services and products to the U.S. travel industry and has information on more than 9 billion passenger flights, providing a detailed view of air travel. Expedia encompasses Expedia.com, an online travel agency with localized sites in 31 countries, and also Hotels.com and discount travel sites Hotwire, Travelocity and CarRentals.com.